Dumpling was born and lives in China. She eats rice or noodles nearly daily. Her first words besides “mama” (which is the same in English and Chinese), were Chinese (阿门and谢谢). Even so, she is the flesh and blood of two flesh and blood Californians. That makes her a Californian through and through. End of discussion. So she will spend the summer in California the way California kids do: splashing around in a pool. Just one problem...she doesn’t know how to swim, and the closest water body is our apartment complex’s mosquito haven of a muddy pond. What to do? Fortunately, an enterprising business catering to Chinese parents with cash to burn on their precious little emperors and empresses opened in the local mall. 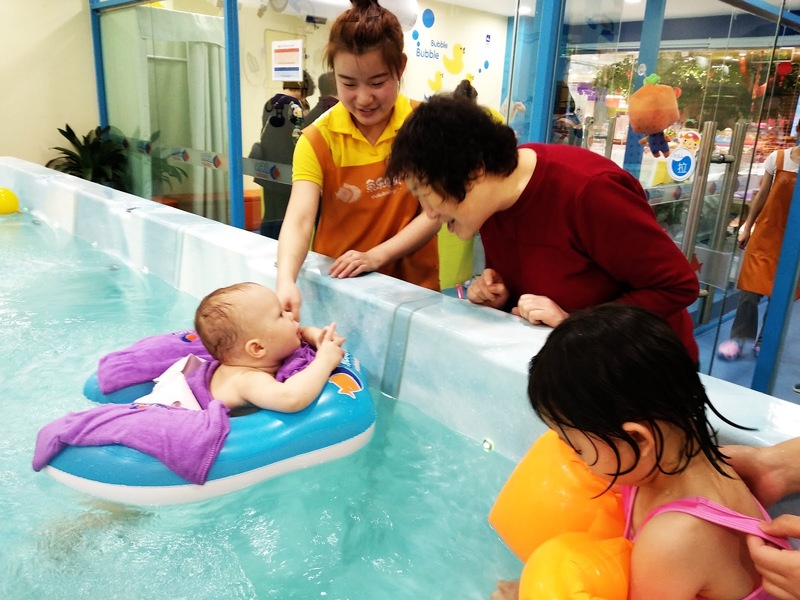 Yule Beibei (鱼乐贝贝) operates a number of baby swimming facilities all over Beijing. 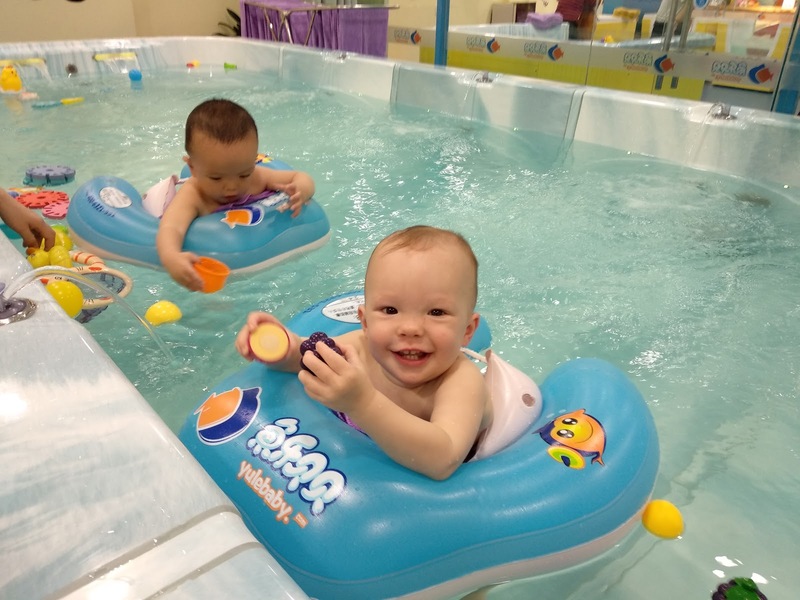 The setup is simple: a few hot tubs full of warm water and floating toys, gracious, young and female teachers, and babies whose parents, many of which lack swimming skills themselves, desire their little emperors and empresses to become little mermen and mermaids. The total time for each session is about an hour. Each lesson starts with some play time, a clothes change to swim gear, pre-dip shower down, thirty minutes in the hot tub, shower, and play. Two types of sessions are available: (1) baby enveloped in floatie while adults supervise from outside the pool (普通游), and (2) both baby and teacher in the pool for a "real" swim lesson (水育课）. For the first type of session, the little student floats around in an inflatable doughnut and plays with any toy that happens to bob by. Only two or three babies are in the hot tub at a time. Meanwhile, the teacher walks around the rim of the pool encouraging the baby to 踢腿 (kick). 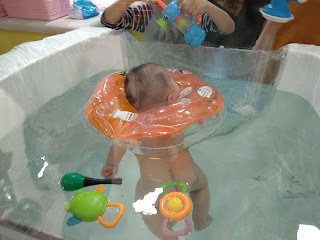 Swimming lesson is like bath time raised to the fifth degree. Every Wednesday and Thursday afternoon, the student can trade in the floatie for a real swimming lesson. The teacher, also gracious, young and female, gets in the giant hot tub with the student. The teacher gently pulls the little pupil through the water and blows bubbles with the goal of teaching the baby to independently swim underwater. A couple months ago, our fearless Dumpling absolutely loved her hot tub time. She laughed gleefully at the supervising teachers, fellow floating babies, and poolside grannies and grampies. She splashed around in the 95 degree water happy as an otter that discovered there was such a thing as fried calamari. She was the envy of poolside moms whose babies that were afraid of the water. In fact, one Tiger Mom chastised her two year old twin daughters for crying: "Look at that brave little girl," wagging her finger toward Dumpling, "Next time, you will be like her. No crying!" While I felt bad for Tiger Mom's babies, my pride swelled big and round like a puffer fish warding off a predator attack. The teachers praised Dumpling as one of their best students. They predicted she will be swimming underwater after three or four personal lessons. My mama ego soon busted like an inflated puffer fish bitten by a great white shark. Two subsequent lessons with the personal swim teacher were disastrous. Little Dumpling cried and cried, her arms outstretched towards me. What could I do? I rescued her from that ill-fated lesson after only ten minutes. Maybe she didn't have a long enough nap. Hoping to avoid a repeat disaster, I made sure Dumpling got a long nap before the next lesson. Unfortunately, the nap did not keep Dumpling's fears at bay. Again, she cried and cried. The teachers sent me out of the room and managed to keep an uneasy Dumpling in the water for the full thirty minutes. Maybe we should call her "Grumpling"
We forged ahead. Maybe Dumpling just needs to go more often. She started go twice a week, once each for the two types of lessons. Persistence has not resulted in a happier little swimmer. 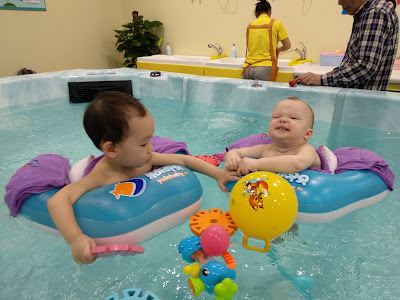 As of now, she’s content enough to float around in the floatie, but wails like a dolphin separated from its pod during the personal swim lesson. The teachers are befuddled. 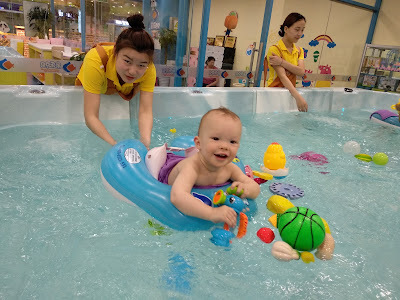 Usually the babies will cry at first, and improve with each subsequent lesson. Not my Dumpling. That would be way too easy. 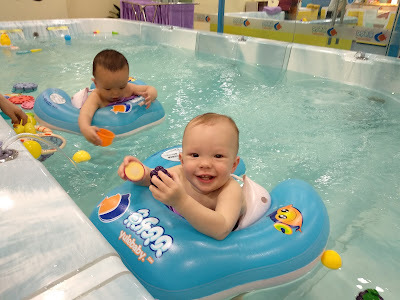 Three months of “swimming” (aka hot tub time) later, Dumpling is nowhere remotely near California swimming ready. Tiger Mom’s babies, on the other hand, are swimming laps across the hot tub. Ah well, at least Dumpling’s getting some exercise and lots of exposure to Chinese speaking teachers. And we haven’t had to throw her into the mosquito haven of a muddy pool. English Translation: It’s time to go to swimming lesson!